The Trojan F-36 Tri-Cabin is a comfortable classic cruiser offering excellent space and storage throughout. Enjoy the sun and star-gazing from the foredeck sun lounge, or BBQ from the cockpit. The cockpit provides easy access to the swim platform, aft cabin, and a large flybridge with seating for many. Below decks you will find the galley and salon well arranged on one level, huge windows, and plenty of storage, along with a custom built-in bar. The aft cabin has port and starboard berths, an access door to the cockpit, and a private head with separate shower. The V-berth with privacy door accommodates two and has ensuite access to the head, and plenty of storage. Need to accommodate more guests? No problem; the L-shaped salon sofa converts to a double berth. Dining in style is a breeze around the hi-lo table that raises and opens to seat six comfortably. 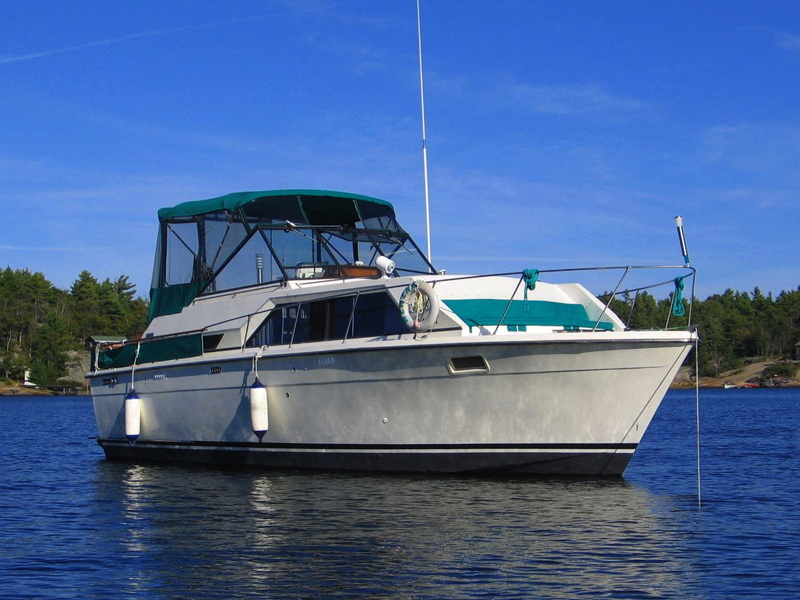 A Zodiac 10’ dinghy with 9.9 hp motor is included. This Trojan F-36 is a complete cruising package, and well worth a serious look.